We’re very excited for the upcoming Can-struction event on Sunday 29 October 2017! From 8 am to 11 am at Lansdowne Mall, students from across Richmond will assemble creative designs out of cans of food. All the non-perishable food items they use will then be donated to the Richmond Food Bank to help our neighbours in need. The teams that have the most interesting designs will win a prize! 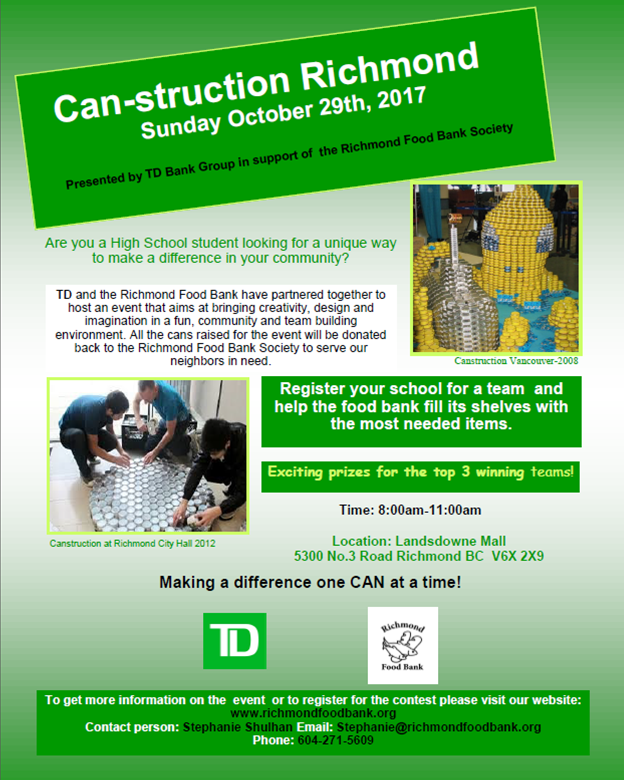 If your school is interested in entering Can-struction 2017, please contact Stephanie (stephanie@richmondfoodbank.org or 604-271-5609). If you want to see what the students come up with, please stop by Lansdowne Mall on Sunday 29 October. We hope to see you there! Can-struction 2017 is generously supported by TD Bank.